Good Night and Good Luck: In the early 1950’s, the threat of Communism created an air of paranoia in the United States and exploiting those fears was Senator Joseph McCarthy of Wisconsin. However, CBS reporter Edward R. Murrow and his producer Fred W. Friendly decided to take a stand and challenge McCarthy and expose him for the fear monger he was. However, their actions took a great personal toll on both men, but they stood by their convictions and helped to bring down one of the most controversial senators in American history. 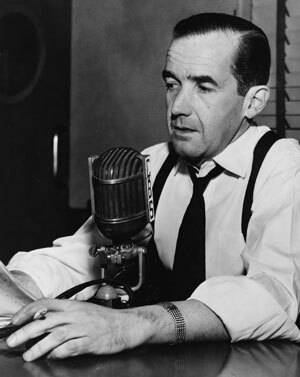 Edward R. Murrow: It is my desire if not my duty to try to talk to you journeymen with some candor about what is happening in radio and television, and if what I say is responsible, I alone am responsible for the saying of it. Our history will be what we make of it. And if there are any historians about fifty or a hundred year from now, and there should be preserved the kinescopes of one week of all three networks, they will there find, recorded in black and white and in color, evidence of decadence, escapism, and insulation from the realities of the world in which we live. We are are currently wealthy, fat, comfortable, and complacent. We have a built in allergy to unpleasant or disturbing information; our mass media reflect this. But unless we get up off our fat surpluses, and recognize that television, in the main, is being use to distract, delude, amuse, and insulate us, then television and those who finance it, those who look at it, and those who work at it, may see a totally different picture, too late. Let us dream to the extent of saying that on a given Sunday night the time normally occupied by Ed Sullivan is given over to a clinical survey of the state of American education, and a week or two later the time normally used by Steve Allen is devoted to a thoroughgoing study of American policy in the Middle East. To those who say people wouldn’t look; they wouldn’t be interested; they’re too complacent, indifferent and insulated, I can only reply: There is, in one reporter’s opinion, considerable evidence against that contention. But even if they are right, what have they got to lose? Because if they are right, and this instrument is good for nothing but to entertain, amuse and insulate, then the tube is flickering now and we will soon see that the whole struggle is lost. This instrument can teach, it can illuminate; yes, and it can even inspire. But it can do so only to the extent that humans are determined to use it to those ends. Otherwise it is merely wires and lights in a box. Good night, and good luck. 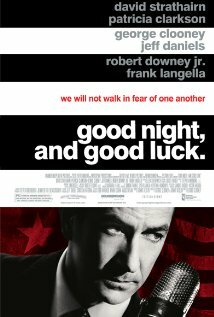 Edward R. Murrow played by David Strathairn. He has a nice role in the movie We Are Marshall.